Even after 22 years in the business of selling homes in Tallahassee, I still find myself amazed at the homeowners who do little preparation when they decide to sell their home. They make a quick decision on who they hire to sell their home, even though it is a decision that will impact them financially by tens or even hundreds of thousands of dollars! A study by the National Association of REALTORS® shows that 64% of home sellers chose the first agent that they spoke to once they decided to sell their home. I do not consider that prudent research for such a large decision, do you? Who Will Actually Sell Their Home? Imagine you have been diagnosed with a very serious disease. You decide you want to interview Doctors before you choose the one to treat you. Aren't you going to be diligent enough to find the one with the highest success rate? One Doctor tells you "I'm currently treating 500 people and I have the most patients in town," while another says "I've cured 98% of the people who have received my treatment." Which one is giving you the information that you need? Now consider a similar scenario, but this time featuring a couple who want to sell their home. Many people are artfully soothed with statements like "I've got the most listings," when they should be looking for the company with the highest home sales rate (percentage of homes that sell versus the homes that they list). After all, people don't really need their home listed ... they need to sell their home! 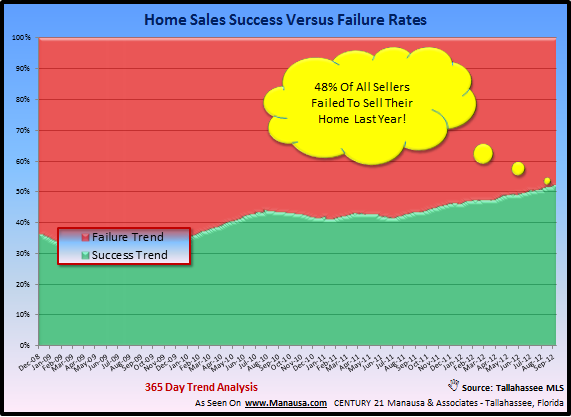 In Tallahassee, roughly half the homes that were listed over the past year failed to sell. That means half the families that thought they were going to sell their home last year were greatly disappointed! What's more surprising is less than 20 companies in town are beating that success rate (of companies that have sold more than just a few homes). Why not hire the company that is selling the homes that they are listing? Wherever you live, it is likely that Google can help you out. I have written hundreds of articles relating to what people need to do to sell their home, and google knows all about them. Recently, I compiled my top 51 articles on how to sell a house, and it contains the type of due diligence information that homeowners should read before they decide upon the real estate company they want to hire to sell their home. If you are thinking about moving, take the time to review some of the advice in these articles. It will save you thousands of dollars in mortgage payments made (when you are paying for a home that you no longer want to own), and even more money during the actual negotiation of the sale. Don't be like the half of the market that won't sell their home, do your homework first so that you interview the top real estate agent for the job of selling your home!